It will help isolate your arms and shoulder while performing dumbbell or barbell curls. It has a uniquely contoured and ergonomic design to fit perfectly around the torso with a quick release adjustable strap for perfect positioning. This arm blaster ensures arms are not moved at shoulder joints and arms are held at correct position. This enables fuller pump, total muscle fatigue and stimulating maximum muscle growth. Unique Contoured Design Isolates arms and shoulders while you perform dumbbell. Heavy Duty Nylon Webbing, Neoprene Neck Pad and High Density Elbow pads protection. Quick and Easy Release Adjustable Strap Sold as individual item One size fits all. 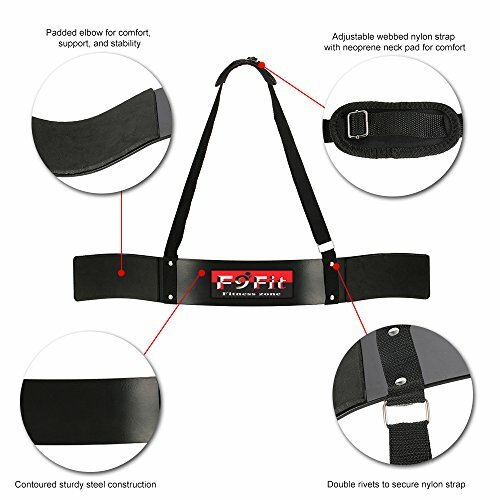 If you have any questions about this product by F9Fit, contact us by completing and submitting the form below. If you are looking for a specif part number, please include it with your message.